Product prices and availability are accurate as of 2019-04-14 16:54:50 EDT and are subject to change. Any price and availability information displayed on http://www.amazon.com/ at the time of purchase will apply to the purchase of this product. Annual. 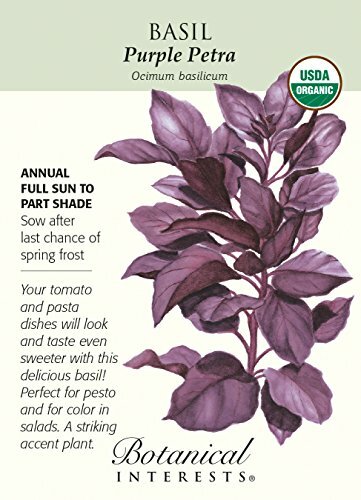 A mild sweet taste that is nice for those of us who love basil's flavor, but shy away from too much herbal spiciness. Excellent for a variety of Italian dishes - pesto, pasta, and salads; makes a lovely pink colored vinegar or oil. Grow as a companion plant for your tomatoes, or in other areas of the garden as an ornamental. Try pairing with Marigold Dwarf Lemon Drop or Bells of Ireland for eye-popping color.